Over the last 15 years, I have noticed more and more shops selling handcrafts imported from other countries. I first saw aikapur in bags in Kathmandu, and also purchased some in Lhasa, Tibet, not knowing then that they were Bhutanese designs. In Otavalo, Ecuador, I was astounded to see Lao-Thai skirt borders being sold as belts, along with sequined pieces that looked Indian, and Guatemalan-style headwraps also being sold as belts. My world was shrinking rapidly! The young man attending the Lao shop assured me that these were produced locally, but to me they look genuinely Bhutanese, down to the chequer-board dividing sections where the number of “legs” in the pattern is counted to indicate the complexity of weaving it. 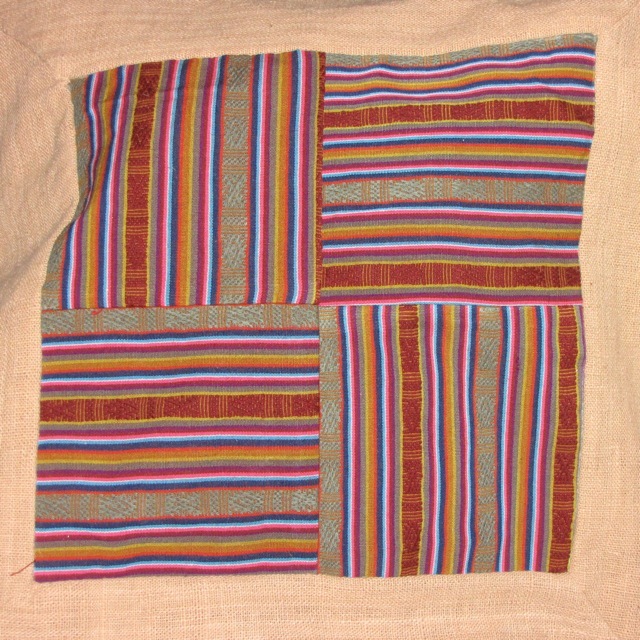 This entry was posted in Laos and tagged Aikapur, Bhutan, ethnic, jedrima, Laos, texilte, traditional, weaving by Wendy Garrity. Bookmark the permalink.